Towards the end of his life Burroughs was writing only in his journals. These are the final thoughts of one of the world's most extraordinary writers, who died in 1997, after a lifetime of notoriety - the granddaddy of the Beats, druggy, dangerous and bleak. William Burroughs died in August 1997, after a lifetime of notoriety. In his final years, he was writing only in his journals. 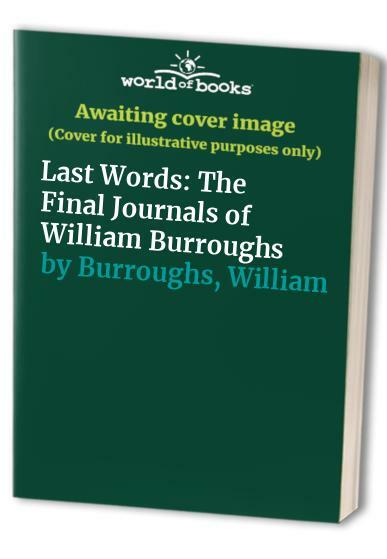 The last nine months of his diaries are here, in "Last Words", and they form a complex, rarely seen, personal portrait of Burroughs at the end of his life, coming to terms with aging and death. Although well into his eighties, the man we see is nevertheless the same old Burroughs, still riling against the Establishment, still contemptuous of the state of the human race, still shocking, bleak and very funny. Full of anecdotes and memories, entries on the joys of housekeeping, dealing with doctors, shooting a video with U2, musings on his beloved cats, drug-taking and government cover-ups, "Last Words" shows us a man reflective but still engaged with the state of the world. Most significantly, these journals contain some of the most brutally personal prose Burroughs has ever written. His thoughts on the deaths of his friends Allen Ginsberg and Timothy Leary provide a window onto the preparations Burroughs was making for his own profound sense of guilt and loss. "Last Words" is unilke anything else in the oeuvre of William Burroughs. It is the purest, most personal work ever presented by this writer, an a poignant portrait of the man, his life and his creative process - one that never quit, even in the shadow of death.